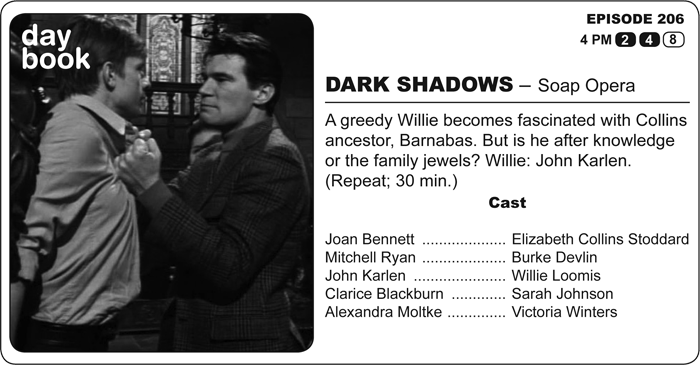 Liz continues to deny her fears over Jason and Willie, while the latter shows intense interest in ancestor Barnabas Collins and his possible connection to a lost cache of jewels. When Burke finds out how predatory Willie is being toward Carolyn, he goes to Collinwood to defend her, but is sent away with mixed feelings by Liz. Burke chides her on her Collins pride as he suspects that she is being dishonest with her reasons for defending Willie. Is it politically incorrect to say that Liz is asking for it? It is? Okay, then Liz is asking for it. It’s class warfare-a-go-go when Liz prevents Burke from twisting Willie like a telephone cord. (Odd that Burke’s not a Collins, thus not good enough to solve a problem that’s not also a Collins.) If she had? Would the rest of the series even have happened? There’s a weird symmetry to the Collins Woes. The message? You just can’t find good help these days. What’s the trouble? Lower class greed invades Collinwood, wanting the best of the house, like, now, pops. And make it snappy. When they go through extraordinary means to get it? Pow! Willie, looking for wealth that’s not his, cracks open Barnabas’ coffin. Who’s Barnabas? Both the family curse and salvation … a vampire made such by someone from the working class who wanted what she couldn’t have. In that case, love. I mention this only in passing. 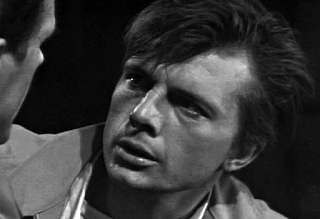 Episode 206 marks the first appearance by John Karlen. Street tough, yes, but also adept at playing fancy lads of all varieties. He was replacing James Hall, who played the part for five episodes with a darker and less playful edge. Karlen, I suspect, had a streak of vulnerability in his portrayal that Hall lacked. It’s fun to side with Willie’s schemes, and Karlen, hardly a wallflower, establishes himself immediately. Welcome to Collinwood, Mr. K! In 2006, twenty days after his wife died, series creator Dan Curtis died on this day of a brain tumor. In happier news, it’s Jerry Lacy’s birthday.